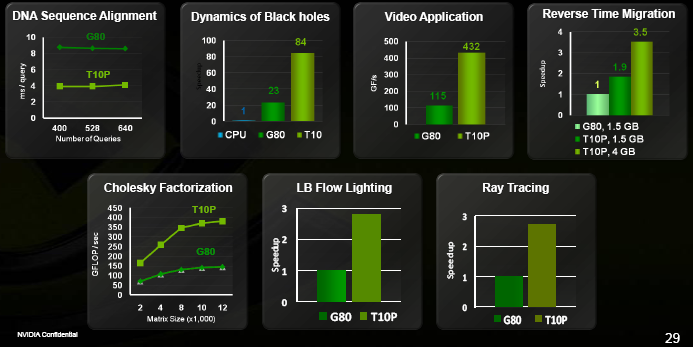 The numbers speak for themselves (we asked about the specific video & ray tracing algorithms being benchmarked, but they could only imply that neither was public). Interestingly, these developers haven’t had much time with the new chips yet, so NVIDIA did not believe new CUDA 2.0 features (which we’ll look at shortly) were used much if at all. These improvements are very much about the improved hardware performance and architecture. The register file per SM increased from 32KiB to 64KiB. There are multiple advantages to this; it makes it much less likely for the compiler to ‘spill’ registers to memory, allows for more threads to run at the same time to hide memory latency, and lets the compiler use more registers for its optimisation process. Apparently, spilling was pretty rare but it did happen in a few applications. In addition to full PCI Express 2.0 support, GT200 also allows for CUDA computations to occur at the same time as one-way data transfers to or from the GPU (as on G84/G86/G9x). So you’ve got two transfer modes: you can both send and receive data at the same time, or keep the ALUs busy while either sending or receiving data. This can drastically reduce the amount of time the GPU is idling when shuffling data around. In the next generation, two-way transfers will be made possible at the same time as computation. NVIDIA also seems very happy about the real-world throughput of their PCI Express implementation, which they claim is in excess of 6GB/s (or 75% of the peak). There’s now a memory coalescing cache in each memory controller partition. With G80, the threads in a batch/warp (or half-warp) had to have contiguous memory access patterns; otherwise, your bandwidth efficiency would drop proportionally to the number of different memory locations you were accessing. On GT200, the memory controller will try to intelligently combine memory accesses to improve efficiency. Don’t expect it to magically go as fast as the optimally contiguous case, but it should still help a lot and make the programmer’s job easier.